Normally, I do not publish posts on the weekend but the recent reprehensible redemption of GJN has caused me to spend some time early Saturday morning to write and publish this post. This is just the latest example of Wall Street sleaze and bad faith. The Egregious Swap Termination Fee Paid to the GJN Swap Counterparty I have not kept count, but suspect that I have now seen over a million examples. In the GJN redemption, the trustee apparently published a notice shortly before sending out the redemption proceeds. The notice is reproduced at QuantumOnline.com and has the notice date as 7/17/12 which I believe would be after the security was delisted and the redemption proceeds forwarded to the brokers whose clients owned GJN. For the first time to my knowledge, the trustee noted in that notice that over $12 million of the redemption proceeds were going to be delivered to the swap counterparty, believed to be Wells Fargo/Wachovia as a "swap termination" fee. This amount was $10.9683 per trust certificate. The remaining $14.6857 would be sent to the owners of GJN. For the reasons given in prior posts on this subject, I doubt that the swap agreement had any value; and no value could really be determined in good faith. GJN Prospectus Guess who is the calculation agent identified in the Prospectus? For those contemplating legal action against the Trustee and Swap Counterparty, this would seem to be a fruitful area of inquiry, i.e., who computed the termination fee and how was it done. In every previous case, where there was a redemption of the trust certificate, the owners received no less than the par value of the certificate. I have previously noted that there are only a few Synthetic Floaters that are available for purchase. Synthetic Floaters It is these securities that have the swap agreement that has caused the problem. I have attempted to interest Gretchen Morgenson of the NYT in the foregoing. Although I did not own GJN at the time of redemption, having sold my entire 150 share position in April 2012, the foregoing events did cause me to re-examine my current minor positions in this asset class. I will continue to keep my exposure to a minimum and nominal amount, and will continue to actively trade those small positions as I did with GJN. I decided to jettison one, JBK, for the reasons discussed below. I have had prior success trading this security. I am not going to buy it back. If I want exposure to the underlying fixed coupon TP in the future, a 6.345% Trust Preferred security issued by Goldman Sachs Capital, I will buy it in the bond market. I am not interested in that security at its current price, which is close to its $1,000 par value. If it fell to below 95, I might consider buying just one. In light of what happened to GJN, individual investors probably need to re-examine any Synthetic Floater owned by them in light of what happened to the shareholders of GJN. To my knowledge, none of the 25 or 30 daily readers of this post owned GJN at the time of its redemption. Each individual investor needs to make their own decisions. I can highlight some issues for consideration. 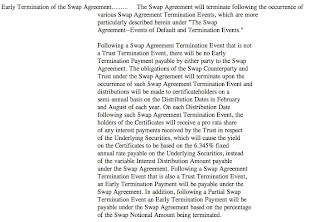 For as long as that swap agreement remained in force, the trustee would collect the fixed coupon payments made by Goldman Sachs Capital and then transfer those payments to the swap counterparty. In exchange, the swap counterparty would transfer back to the trustee what was owed to the owners of JBK. That amount would be the greater of 3.5% or .75% above the three month LIBOR rate, up to a maximum of 7.5%. At the minimum coupon, the swap counterparty would earn a risk free spread of 2.845%. In that context, risk free simply means that the swap counterparty did not bear the credit risk of a GS default or a deferral of interest payments permitted by the TP under certain circumstances. 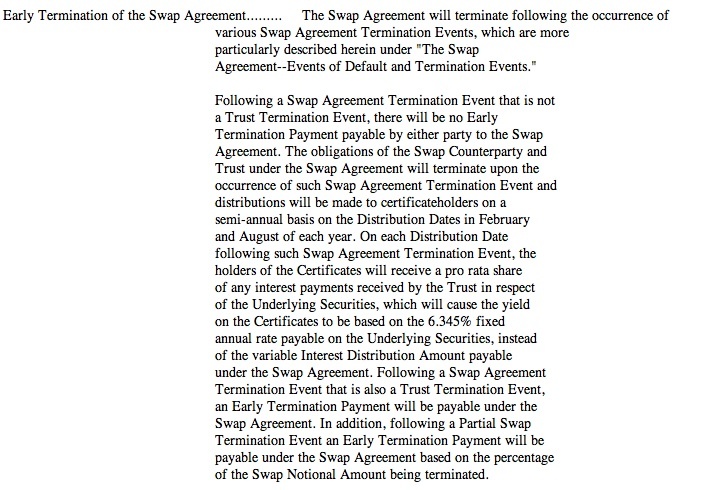 When Lehman filed for bankruptcy, the trustee took the position that such a filing constituted a swap termination event that was not a trust termination event. I believe that is the correct position based on my reading of the prospectus. The trustee, thereafter, quit transferring the payments received by GS Capital to the swap counterparty. Instead, as provided in the prospectus, the owners of the TC JBK started to receive the fixed coupon payments made by GS Capital on a semi-annual basis. Since those JBK owners had been receiving the minimum coupon of 3.25%, this constituted a coupon raise for them from 3.25% to 6.345%, though they would no longer receive quarterly distributions. The trustee took $100,000 out of the first semi-annual payment after the swap termination. Trustee Distribution Statement I noticed that deduction and made some brief comments about it at New Information about JBK. A reader has informed me that the Lehman bankruptcy estate was claiming a right to compensation for a swap termination. And, that would explain the $100,000 debit by the trustee to pay lawyers to fight that claim. This reader had contacted David Kolibachuk (212-361-2649) who is the person at U.S. Bank Trust who acts as the trustee. Personally, I think that such a claim is frivolous, but I have seen many claims lacking in merit succeed in my days. Of course, I am not the bankruptcy judge and my opinion is not binding on anybody of course. There are some other provisions in the JBK agreement that distinguish it from GJN. There is a provision that makes it clear that the JBK owners will be paid the principal balance of the TCs, plus accrued interest, in the event the underlying security is redeemed by the issuer. (page S-8). There is also a make whole provision that would require GS to make a premium payment for an early redemption of the underlying security, with two exceptions. Neither of those exceptions are for a capital treatment event. I am tired of fooling with this one. It does generally have a current yield about 1% greater than other TCs with the same underlying security. I have just reached the point that JBK is not worth the trouble of that extra 1% under the circumstances. 2. Reassessment of Synthetic Floater Positions: This leaves me with the following synthetic floaters. I have traded all of these securities, always in small lots. All of them are owned in a ROTH IRA due to tax issues associated with the swap agreement. I do not plan on selling these positions based on what happened to GJN. I will consider selling them based on price and profit considerations, which is what I have been doing. I discussed the reasons for keeping GYB in Item # 3 GJN Redemption, near the end of the post. 1. The underlying security is the same GS TP that matures in 2034. It has a "make whole" provision and does not contain an escape provision for a "capital treatment event" (pages S-24-25). 2. The prospectus states that the owners of the trust certificates will receive the principal amount upon redemption of the underlying securities. (p S-10). 3. I have been successful trading this security in the past. 4. It does have a role to play in my asset allocation scheme in my ROTH IRA, since the security does provide some deflation protection in the minimum coupon and inflation protection in the LIBOR float provision, particularly when bought at a significant discount to par value.